After a month’s hiatus, your musical hit returns with a vengeance! First up, a topical choice: the sound of sunshine that is Astrud Gilberto. The second track is by the enigmatic Leikeli47. Hailing from Brooklyn, the woman behind the mask can be seen sporting a colourful range of balaclavas in all publicity and performances, granting her a level of anonymity unheard of for most women in music. Read more about this elusive artist here and here. I only discovered Ramona Lisa recently, but I’m looking forward to listening to more of her dark and brooding work. The side-project of Caroline Polachek, front-woman with the band Chairlift, the album ‘Walking in the Cemetery’ is taken from was, apparently, inspired by travels through Rome. ‘In God’s Hands’ is a staggering return to form for Bat For Lashes. Her new album The Bride is due out on 1 July and she’s touring in the months leading up to this, but many dates are already sold out, so nice work if you’ve successfully snaffled a ticket. I really wanted to include Carly Simon’s ‘Why’ in this playlist, but can’t find it on Spotify anywhere, sadly. You can listen to the track and watch the video below – hope you enjoy. Click here for your April playlist. Happy listening! 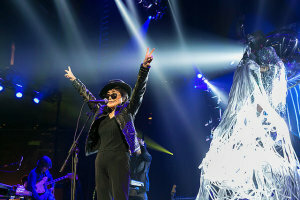 The image is of Yoko Ono performing at an Amnesty International concert in 2014. Yoko is onstage, dressed entirely in black: trousers, top, jacket, sunglasses and hat. She stands in front of a microphone, arms raised above her head, in a victorious pose, with both hands making the international sign for peace. The picture was taken by Greg Chow and shared under a Creative Commons licence.